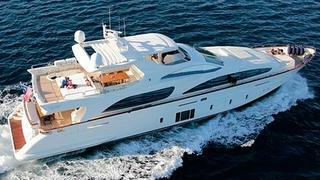 Peter Mison at Simpson Marine in Hong Kong tells me he's closed on his listing for sale, the 31.4m motor yacht Escapade, with Fraser Yachts representing the buyer. An Azimut Grande 105 foot model delivered by the Italian yard in 2012, Escapade spent a successful charter season in the Mediterranean before heading for Southeast Asia. A restful, warm interior is in wenge wood and cream carpets and, in the main saloon, the usual dining table configuration has been replaced by a bar and floor to ceiling wine cooler holding up to 200 bottles of wine. The flybridge is equipped for al fresco entertaining and dining with a custom barbecue, L-shaped bar with fridge, icemaker, Bose outdoor speakers and seating for eight guests. Below, accommodation is for 10 guests in four staterooms. The master suite is filled with light thanks to large windows, and it has a king size bed, vanity unit, desk and settee, while the VIP stateroom also has a king size bed, desk and a settee. Two twin cabins complete the accommodation and each has a Pullman berth. All staterooms have Samsung television screens, Blu-Ray DVD systems and full en suite bathroom facilities. Twin 2,200hp MTU engines give Escapade a cruising speed of 13 knots,a range of 1,500 nautical miles and she is fitted with zero speed stabilisers. Based in Southeast Asia, Escapade was asking €5.8 million.